By GreenEyedLillies on January 4th, 2009 . 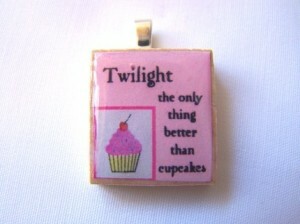 Filed under: Cupcake Ideas, Jewelry . BUY 2 get the 3rd one for FREE! *This deal is unlimited so for every 2 pendants you buy you get 1 free! ♥ The pendant measures .75″ x .75″ square. It has been decoupaged and then a clear non-toxic resin has been applied to protect it and give it a wonderful gloss-like glass appearance. A sterling silver-plated bail has been added. The bail has a 6mm opening, perfect for a cord, ribbon or necklace. ♥ Letters on back vary. ♥ This item is not waterproof. Please take care to avoid any contact with water. Also, please keep away from extreme heat. Not intended for small children as it poses a choking hazard. ♥ Any light spots pictured are from my camera and not actually in the pendant.